The center piece overlooks Duluth’s Down town. The Duluth Central High School development project agreement â€” touted as a much needed antidote to housing woes and key to removing a heavy financial burden for the Duluth school district â€” has fallen through. Here’s what I said about the apparent sale that got me censored last December. In preparation for writing a book about what led up to this last disasterous year I found a couple interesting tidbits after dusting off my old Red Plan records. Eight years and half a billion dollars later the Trib’s hopes have been utterly dashed. 2007 was the year I began speaking out against the Red Plan. It prompted me to run again for the School Board that year. The Paper ended up endorsing my opponent, a supporter of the Red Plan, who helped bring about just what the editors feared would happen. I lost. Now eight years later, my opponent is stepping down from the Board pleased with its many successes. Equity is not one of them. “There is only one problem with the red plan that the top dogs have conceded. It will, according to a map sent by the district to the Minnesota Department of Education, split Duluth along 14th Avenue East into rich / poor, high minority / low minority halves. There is a great irony in this and Jaros knows it well. His law originally allowed some building without referenda for, among other reasons, to encourage integration. It’s ironic because the red plan kills our integration program and segregates Duluth. It completely violates the spirit of Jaros’s law. Over time the red plan will impoverish Jaros’s western District as its prosperous residence flee to eastern Duluth. Shiny new schools will not stem this Exodus. I truly hope that whoever steps into the shoes of our departing school board members steps up with their eyes wide open and a willingness to peep under the rug that their predecessors nailed to the floor. The book, should I undertake and complete it, will be written to help pay for Art Johnston’s legal bills. I will send a copy of my book to any contributor who makes a donation exceeding $20 dollars to the cause of free speech. You can make a donation on line here. 3,000 books should cover the cost. Twenty bucks is a helluva lot less than anyone, especially our children, is having to pay for the Red Plan. After a week or more of blog inactivity but mental overload its, as always, hard to know where to begin. The School Board race? Oh, you betcha,that will determine how successfully the new school board will thread its way through a minefield sowed by past and the current Board. The remarkable week of the Supreme Court and Charleston? Absolutely. What the court does has been on mind since second grade when my five year old neighbor Donna Beth parroting her father declared to me “I don’t want to go to school with no niggers.” This is one of the first quotes I heard that I’ve never forgotten along with: “your Grandfather was shot [in World War I] and he didn’t cry.” The former was in Topeka, Kansas newly ordered by the Supreme Court to integrate its public schools. The latter was what my Mother told me several times post toddlerhood when I came crying to her with skinned knees and such. To escape the School Board on the eve of School Board filings I’ve once again begun reading a book out loud to Claudia. I’m over half way through with the 550 page Wild Swans. One of the recent chapters really had me thinking about the Duluth Schools. Called “Famine,” it described the dim witted policies of Chairman Mao who single-handedly forced tens of millions of Chinese Peasants in the late 1950’s to leave their farms untended while scouring the landscape for old nails and scrap metal to melt into nearly useless pig iron. Millions starved while, like in the tale of the “Emperor’s New Clothes.” no one in the Communist party had the courage to say his policies were misguided. Boy, if that doesn’t lead into a discussion of the Red Plan and its aftermath I don’t know how else to take it. I’ll just repeat this for about the umpteenth time. I like President Obama. Unlike most of his critics I think he has negotiated the Presidency pretty darned well. I’m especially pleased that in the recent weeks he has finally felt comfortable enough to be more candid. That’s something I appreciate just as I appreciate how candor can be an impediment to progress. The President himself recently uttered the “N” word. Charleston has done a lot to upend the Red Neck self righteousness that used the Stars and Bars like a big middle finger. Somebody’s always knocking. It leaves me with so much to blog about. Its true that the most recent post varies from the earlier one in the numbers expressed. Most recently I wrote that Tim was pulled over six time in six months. In my earlier post, just after talking to Tim I put it at an even more alarming number – six stops over a summer or six stops in three months. My Buddy says of the inconsistency that I am not “forthright.” I can’t deny that the two figures are inconsistent but I think I can be largely excused for this on two grounds. First, I myself linked to a previous post which exposed my earlier claim. I’ll admit I did not go back and reread it to guarantee consistency. Rather, I recalled what I could remember being told. Secondly, I avoided escalating my numbers which might have been expected of a person attempting to bolster his arguments. Instead, I halved the real numbers thus undercutting my case. I’d like to think that is evidence of my natural inclination to avoid exaggeration. I’m not a fanatic about what I regard as details. I will round figures up or down for simplicity’s sake. I write that the Red Plan cost a half billion when it was twenty million short of that total. I just don’t happen to think that the difference between 480 million and 500 million is that big a deal. Earlier my Buddy criticized me for unfairly calling out Duluth’s police force for leaning too heavily on black drivers. There is some justice in this criticism. I didn’t go to the police department with my complaint. Instead I aired it on this blog. In doing so I was relying on my sense that Tim’s story had the ring of truth to me. I do trust my judgement in such matters and the anecdote I just related from last week adds weight to my judgement. I’m not sure what I would recommend our police force do. I think patrolling high crime areas makes sense. However, knowing that spending time in such areas where pulling over black drivers is more likely it might make sense to start making a point of pulling over white drivers for small infractions to even the score. Certainly, if I’d been pulled over without Tim in the passenger seat I wouldn’t have felt called upon to reiterate my earlier concern about unequal treatment of black drivers. Some folks have made a big deal out of the fairness issue when it benefits them. Some white Americans have killed off a lot of Affirmative Action by complaining that it unfairly favors minorities. Well, if we are going to eliminate quotas to keep things equal perhaps we should bend over backward to make sure white drivers are pulled over as often as black drivers – to keep things equal. It might not improve anyone’s driving or catch any more criminals but I think it would have the salutary effect of putting suspicious black drivers in a much better frame of mind. Fair’s fair. It’s hard to know where to begin so I’ll start with the obvious. We don’t have the money now to begin a seven hour day. Offhand, I don’t know what it would require but a few months ago I got the impression that a million dollars would be needed annually to add a seventh hour to either the middle schools or high schools. We would have to double that if we wanted to offer seven hours at both the middle and high schools. I think it is safe to say that after the last year of school board bickering it would be damn near impossible to convince the public to pass 2 million or so dollars of new tax levy increases. I think the only way we could pass such a referendum would be for the School Board to promise new classroom programming rather than staff pay raises. 1. For good or ill we’ve just bought ourselves half-a-billion dollars’ worth of new schools. 2. We would be foolish to let that investment turn into empty schools that would drag all of Duluth down at a time of promising economic growth. 3. New housing and business is the only way to help reduce the per capita debt load of the Red Plan. If successful it would also result in new state revenue when students returned to the Duluth Schools. 4. We acknowledge our past mistakes but promise that, with the public’s passage of a referendum, we will put all new revenues back into the classroom. 5. We owe it to ourselves to give Duluth’s children the same educational options available to children in every other school in the area. I’ve started and stopped this reply to you on several occasions. That five-point program at the end is the most hopeful I can be for now. I don’t see us asking for such a levy until we have a new and trustworthy school board. Hopefully, we will have it after this year’s school board election. At last night’s school board meeting (about which much could be said) other than the Trib’s take that we are getting past the bad old days of teacher layoffs, Art Johnston passed out several graphs related to student enrollment. Art passed the graphs out during our discussion of student enrollment but they only got as far as the Chair before Ms. Seliga-Punyko announced that they should not be looked at because they were not reviewed in advance of the meeting. They got no further than Clerk Rosie Loeffler-Kemp who hung on to them before they could get to the rest of us. Mike Miernicki began making his usual huffing and puffing noises fearing the worst. WADM’s discussions (showing a continued decline in students) always drive him nuts. When told they would not be passed out Art announced that he would pass them out himself. This grevious threat prompted Clerk Loeffler-Kemp to let the graphs resume their progress to the rest of the School Board. The graph shows the number of graduating students at the three high schools year by year from before the merger until well afterwards. If you haven’t read his full post yet I’d highly recommend it. I wish that the Red Plan’s supporters would stop being so defensive about the obvious challenges their baby left us with. In some cases, as with our Board members who tried to rid themselves of Art Johnston, this defensiveness seems to have led to a cocoon of self delusion. I’m sorry but when a child of the traumatic transition commits suicide because of the chaos he endured because of it and we refuse to acknowledge the part the chaos played in his death we are not serving any good public purpose. That we wanted to minimize the bad press to help pass a referendum for a new levy for the schools is no excuse. Had we been more honest it would have offered voters all the more reason to pass the levy……to get past the chaos and return to normal. Today’s story is the second recent story that makes it seem like ISD 709 is returning to normal but I don’t buy this conclusion. Our new normal is much reduced from what it was back when, like all the other area schools, we still had a seven-hour day. The chaos may be abating but not our want. Rainy Morning: something I’ve longed for during a week of sunny days. Needed to buckle down and sift through oceans of paper that I’ve let accumulate all over my brand spanking new office. Birdwalk: A term picked I up from Mary Ann Lucas-Houk, former Assistant Superintendent of Curriculum for the Duluth Schools denoting a discursive discussion off topic, i.e. a detour from prioritized work. Out of bed by 3 AM after much needed four hours of sleep. Ate an apple, made pot of coffee, fought off hungry cats, took a card table to attic office for another flat surface to organized massive amounts of paper. Sat down and made up a list of 20 things on my mind with view to post to show my state of distraction. Cranked up Computer at 4 AM and saw Google’s “doodle” on 130th anniversary of Lady Liberty’s arrival to New York in 1885. Tried to remember if Grover Cleveland was president when my Grandfather George Robb was born. He was. Jotted down the election years just before turn of the century to recall who got elected when. Thought back to the great book, The President’s War, about all the ex-Presidents living when Abe Lincoln got elected. (The last two digits of every year that begins a new Presidential term of office always jumps four years at a stretch each century and remain the same making it easier to recall who was elected when. For example 1792 Washington, 1892 Cleveland, 1992, Clinton). Wondered if I could still recall their order of succession. Couldn’t quite do it. Should have remembered that Taylor was hero of Mexican American War and was elected in 1848. After this review I can once again do what my Grandfather did to my amazement fifty years ago – recite all the Presidents in order……. until I forget Taylor and Filmore again. Good. First post of the day in. Now off to clip a month’s worth of newspapers to see what I’ve failed to blog about recently. After which I will see how hard I can press my nose to the office organizing grindstone today. Art wasn’t kidding. I found his Father’s book at Amazon on offer for $2,500. Art did most of the writing and its been rated well by the few folks who have weighed in on the book. This is today’s big Duluth Education News. Duluth Edison Charter Schools plans to split from the for-profit company that has helped manage the schools for nearly 20 years. Beginning in the summer of 2017, the schools will be led independently but will retain the Edison name. It will happen the same year the recently approved new high school is slated to open. The deed is all but done. Hashing over what we might have done might be instructive (and I will hash things out) but such a hashing won’t change the outcome. Duluth needs to be clear that we have several public school systems in town. All of them need our support hopefully without them being pitted against each other to everyone’s detriment. It will take a lot more work than the current school board’s ostrich-head-in-a-hole approach to the challenge. If you come to Lincoln Democrat to understand our public schools I must direct you to Karl Schuettler’s demographic analysis of Denfeld’s missing students. It will take more than fancy swimming pools to bring them back. In the long run the whole District’s best hope is all the undeveloped land available out west and a continuing construction renaissance and commercial boom – that and an “inequitable” spending of the District’s resources out west to make up for all the damage we’ve done. Art Johnston’s got a new fundraising website – sorry don’t have the URL yet. My personal plans are to write a book to help pay off Art Johnston’s legal bills should the Federal Courts fail to order the Duluth School Board to reimburse him for attacking his good character over the past year. Fortunately for Art his talents as an engineer – the skill that got him involved in helping expose the Red Plan for its flaws – are in such demand by various Department of Transportations, the Forest Service and other public entities that he has managed to keep ahead of the legal bills. I’m still offended that he has to put his retirement time to this purpose and determined to tell the other side of the story if it will help compensate him for his efforts. Geez, being on the Duluth School Board is enough of a sacrifice without having one’s colleagues conspire to blacken your reputation and attempt to drive you into bankruptcy in the attempt. Even as he continues his service on the Board and pay off his legal bills Art makes time for other community activities. He’s acting as a foster parent delivering Meals on Wheels and the other weekend went fishing on a local lake for some tourney that was raising money for some charitable cause. He told me that five of the homes he took food to had residents that thanked him, out of the blue, for his work on the School Board. Then he told me that he barely knows how to bait a hook because he doesn’t fish. While he was on a boat with a handful of other folks he was having trouble pinning a minnow to a hook. He didn’t mention to any of his fishing companions that he was a Duluth School Board member but it turned out they all knew it anyway. At some point it came up and he sort of appologized for the Board but everyone laughed and he was told they all supported him. I hear the same from folks in my east end of town but not perhaps quite as often. This is still the end of town with the die hard fans of the Red Plan although few attempt anymore to justify it as our new candidate Dr. Kirby seemed to when he said our new swimming pools were great facilities. They are. What I found funny was the thought of poor Art killing his minnow. Art comes from a fishing family. His Father was a commercial fisherman on Minnesota’s second larges lake, Lake of the Woods. Art even co wrote a book about his family’s long fishing history which I’d like to get a hold of. Unfortunately, its out of print and I can only find it on Amazon for hundred’s of dollars. Fishing Lake of the Woods made a sailor out of Art and he sails Lake Superior all summer. But his fishing was all done with nets and he never had to bait a hook to haul in a hundred pounds of fish. That reminds me of one of my great ideas. The first year I was in charge of the Chester Park Carnival Games I thought it would be cool to get a huge net and fill it with balloons to drop on the carnival goers. I called up Duluth’s Commercial fishermen the Sivertson’s of A. Kemp Fisheries and asked if I could borrow one of their nets for this purpose. They said sure and I went over to pick it up. When I unrolled it on the Chester Park Gym floor it let loose a most powerful fish cleaning table stench that quickly filled the auditorium. I rolled it back up and got it the heck out of the school. Who needs a hook when you’re dragging a net with that kind of fragrance to attract the fishies? Claudia asked me why I was pacing the kitchen this morning. She didn’t realize I’d hopped out of bed at midnight too agitated to sleep on my brand new pillow – one that wasn’t crushed flat. I thought running a few errands at Walgreens might work of my restlessness. I should have just started blogging but I couldn’t quite convince myself that looking at a bluescreen was the thing to do. Instead I slept fitfully on and off on our couch till the early hours then paced as I made my morning coffee….. Claudia has given it up for tea to get a better night’s sleep. I’d just picked up the Trib and saw that the local Edison Board is planning, in large part, to sever their connection with the national Edison corporation. Its been on their minds to do this for many years. Now it will be done in tandem with their setting up their new high school. Its going to be a sunny day and my grandsons are coming over so I will limit my blogging despite an avalanche of things to shoot my fingers off about. Tomorrow it looks to rain. Maybe I’ll be able to work off my pacing instinct then. But let’s just see if I can work on tomorrow’s foundation till the boys arrive. I’ve recently began a number posts with a long list of terms or phrases each of which represents something on my mind about which I feel like blogging. On the previous occasions this led me to actually cover the some of the subjects. Today I’m having a hard time conjuring up the dozens of posts I’ve recently neglected to write about. I certainly wanted to follow up the last post five days ago with an item from one of our school board committee meetings that fit right in. At the moment I can’t think what it was either. For better than a week I’ve been telling myself that what I really wanted was a vacation from Duluth and ISD 709. That wasn’t available to me so instead I took a mental vacation thus the absence of posts. I’m not quite ready to end my mini vacation. Its soooo beautiful outside now and will be again tomorrow. A glass of wine on the patio reading to Claudia sounds about right. I’ve earned it. I spent two hours finishing my mulching this afternoon after putting in a thousand yards in the pool. Oh, we have another swimmer who has announced an intention to run for the Duluth School Board today. He’s a competitive swimmer so I imagined myself swimming against him as I swam laps. It takes me ten minutes to swim 500 yards so I doubt I’d be much competition for him. Until I get around to clearing out a backlog of posts please listen to, or read, this story from NPR. Last March my Brother and I met to place our Mom by our Dad in Mankato’s Woodland Hills Cemetary. We didn’t have a funeral but on my way down to Mankato I called one of my Mother’s friends to explain that we would be interring her on Saturday. I asked if she could call a half dozen friends of Mom’s who had jointly owned and run a popular boutique called Harpies Bazaar. I was thrilled when they gathered at the Gravesite the next day and listened as I told them about our Mother’s life and the last few years. They joined me in my Grandfather’s favorite song Wayfarin Stranger and then invited us to go out with them to breakfast. 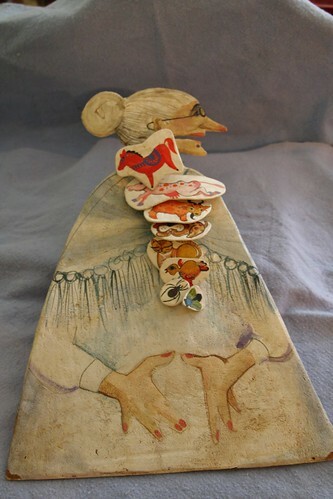 We shared stories for a couple hours and one of my Mother’s friends told me how Mom had made her a “Little old lady who swallowed a fly” for her elementary school classroom. She just sent me a picture of it and I was pleased. I had no idea how my Mom managed it. You can see the critters from the fly to the horse each of which slide down a channel my Mom made from the old lady’s mouth to her tummy. I told all the Harpies that I hoped to write a little coffee table book of my Mom’s life and her artwork. That’s why her friend made sure to send me this. It would be far more gratifying for me to write about my family (for a small circle of my friends and family) than it would be to expose the warts and blemishes of the Duluth School Board. Please Federal Court…… award Art his attorney fees, please, please, please. A week ago we asked the boys if they wanted to plant a fairy garden again this year. Never heard of them? Well, they are all the rage……except that our boys decided they wanted something different. 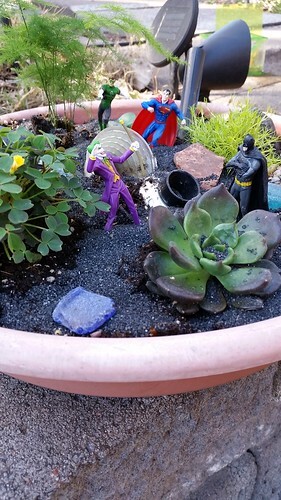 This is our Super Hero Garden. When we went to Gordy’s to pick up plants we explained what we were doing to the clerk. She thought that was a great idea. We went back a couple days later to buy plants for a Minecraft garden. The same clerk waited upon us but didn’t recognize us. When we told her what we were up to she said someone had come in to make a Super Hero garden the day before. We confessed that it was us and she said she was planning to make a Harry Potter Garden. I like Rep. Erik Simonson. I didn’t particularly want to. The old Republican in me is still irritated that Duluth continues to automatically elect Democrats even though Republicans no longer consider me a Republican because I’m so darned “librul.” Heck, I even think Barack Obama has been a pretty good President and not a traitor. Like the President Erik is a very rational politician. I wish, however, that Erik’s column in today’s Budgeteer had been written a year ago when something could have been done to head off what I fear will be a fateful collision between Duluth’s two public school systems. Of course, our ISD 709 school board made this year’s number one priority the silencing of a fellow school board member. Collectively we look a lot like one of those colonoscopy billboards. And while we were looking one way the Edison community pulled off a secession and, at this point, I don’t see how it can get undone. …the Edison board is not an elected board. It is an appointed board, not held accountable to the voters of Duluth or of ISD 709. Is that a big deal? I am asking Duluth to have that very conversation. It does seem to me that at the very least, any school system receiving public funding should be required to have a board elected by the taxpaying voters in the district it serves. Why? Because I have a sense that if this school is built, we will see enrollment concerns in ISD 709, which will be followed by further discussions on how to do more with less. And I am just not ready to accept that is in the best interest of our kids. Above the commentary you will find Richard Thomas’s droll cartoon (sorry its not on the Budgeteer website yet) with, Al, his Lake Superior Monster puzzling over the new high school to be. Richard called me before submitting it to get a little history on Edison. You can find plenty of that history on my blog. Erik’s predecessor in the legislature, Mike Jaros, sent the School Board an email he sent to Erik. I tried to reach Mike afterwards to compare notes. He has some insights on the subject of Charters that predate mine. I could quibble with some of his observations in large part because I voted to explore Charters 19 years ago although I supported a teacher led Charter which was just featured in the DNT’s June 3rd bygone’s column. * The Toivola-Meadowlands Charter School, created in 1993, has become something of a local laboratory for educational reform. At the school, students are often grouped by ability rather than age, classes are scheduled in 80-minute blocks and Fridays are free days. schools in Duluth School District 709.
might have to reopen Central High School in the original building downtown and close Denfeld and East? Thank you for your attention and work on the above problem! As for Erik’s theory that all public bodies spending tax dollars should be elected I’m afraid there are a lot of examples of such unelected bodies doing just that. For starters, there is the IRRRB (Iron Range Resources and Rehabilitation Board). Good luck prying that out of the hands of Iron Range legislators. Parts of this are x-ed out to avoid unuseful ill feelings. I’d been sent the news that I would not be handing out diplomas at the East High graduation. That seemed an ill omen for a return to the location that spawned the last heckish year for the School Board. After a hard stare at me the manager whisked my chutzpahtic companion in. I suggested that the balcony might have a few more seats and then went in to the front of the main floor where I was to be seated. A few minutes later seated by myself with none of my board colleagues apparently to sit near me Tim showed and leaned over to tell me he’d noticed I seemed not to be very popular. I gave him a big grin. A little later Art showed up and sat down and Tim moved off to talk with some of the other notables. Then, still charmed, Tim came back to inform us that he’d gotten the OK to join us. I have no idea who he asked. Art and I joked back and forth until the ceremony began curious to see if we got booed when our names were announced. We weren’t. I saw our student Rep, Jude Goosens, take a seat near us on the stage next to a timpani and asked him if the instrument was “his baby.” He blushed a bit, and I barked out with a laugh “How come I’m not surprised?” Jude has a glorious bass voice. Art and noted one notable void from last year’s ceremony up on the stage. I’ll say no more. As we walked out shaking our heads we got to the lobby and talked. Then we looked up on the wall and saw a digital screen showing the empty stage. We wondered if it was recording the event. Then we wondered if it had been on during the previous graduation and, if so, whether that tape still existed. It could prove how hard a “shove” Art gave the Superintendent. We went back to ask if it was recorded. We were told us that it was probably just a live feed but were encouraged to call the DECC office the next day. I just called. It’s only a live feed. 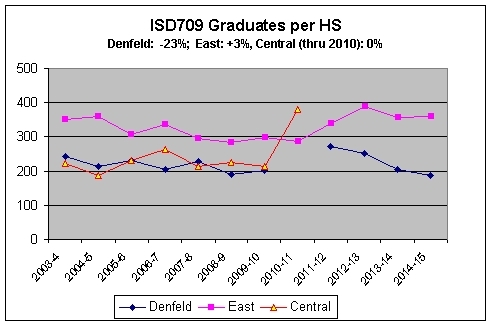 Its been a long time since I’ve put anything other than ISD 709 miasma on the blog. This is cool and its probably already on Bob King’s Astronomy blog. It shows how the football shaped moon Nix moves in its orbit around the binary Pluto/Charon combination. No spiral here.